If you’re a distributor and have questions about the cloud, here's your answer—it’s time to move. You’ll have less to do, and security and reliability to gain—so you’ll have more time for your customers, your employees, and other priorities. This eBook from Epicor explores the simple, economic, and reliable reasons distributors are moving to their business systems to the cloud. Cloud is actually pretty simple – it’s simply using technology over the Internet. When you update your Facebook page or check your bank balance on your phone, you’re using the cloud. But is it that easy for your wholesale distribution business? Yes. The cloud has proven to do several things very well for distributors—improve your cash flow, increase business capabilities, and simplify processes across the board—all in an access-from-anywhere system that’s far more reliable than hardware you have on-premises. 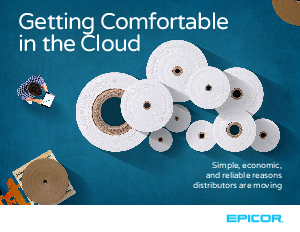 Read this white paper to learn the simple, economic, and reliable reasons wholesale distributors are moving their ERP solution to the cloud – and gain an understanding on how Epicor can deliver the solution that best fits the needs of your distribution business.